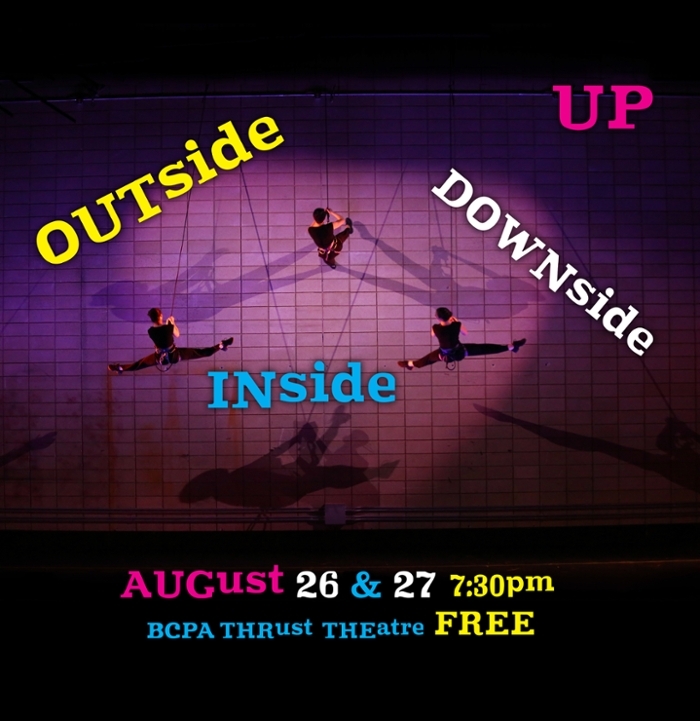 This year's Vertical Dance summer concert, OUTSIDE INSIDE DOWNSIDE UP, is set for Saturday, August 26 and Sunday, August 27 at 7:30 p.m. in the Thrust Theatre of the Buchanan Center for the Performing Arts (BCPA). The performance is FREE and the public is cordially invited. Donations for the Laramie Food Bank will be taken at the door, either canned goods or cash. Since 1998, Vertical Dance has been an end-of-summer favorite with local audiences, with performances at Vedauwoo, in the Berry Biodiversity Center, on the outside of the Physical Sciences building, and now in the new Thrust Theatre in the BCPA. Created by UW professors Margaret Wilson and Neil Humphrey, the site-specific vertical dance choreography features UW students dancing both near to and far away from the audience. “Lights Along the Shore,” a trio consisting of Rod Garnett (flute), Blake McGee (bass clarinet) and Lisa Rickard (keyboard/piano) will perform during the production, collaborating with the dancers to create a musical score featuring original compositions and adaptations of musical works from all around the world.